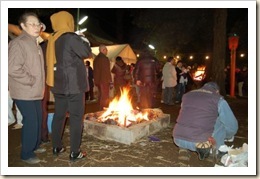 The New Year celebrations began in earnest for us with the traditional bowl of soba noodles at midnight – said to ensure long life – followed by a visit to our local jinja. Drawn by a combination of spiritual need and the prospect of free sake, we donned coats and headed out into the chill night air. The jinja is literally at the end of our street and is mostly deserted for about 364 days of the year. But not tonight. It seems like a few other people had had the same idea! 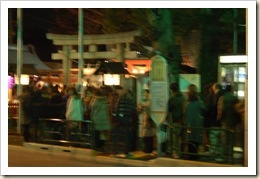 The queue stretched from the jinja about half a mile down the road. Still, undaunted we persevered and waited patiently inline for our chance to step through the ring and offer our prayers for good fortune in 2009. For the Japanese, each year is considered a separate and distinct entity. The visit to the jinja and its purifying ceremony draws a line under the year just gone and means that everyone can begin the New Year with a clean slate. Japanese people attempt to finish the year will all business taken care of and bills paid so that nothing is carried over into the New Year, so for the last few days all the post offices and combini stores have been packed with people paying bills. Although it’s not possible to settle everything by Dec 31st, this idea of being “reborn” each year, spiritually clean and refreshed remains a very attractive one, and I think is perhaps one secret behind the Japanese people’s legendary grit and endurance. 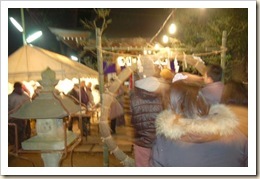 The normally deserted shrine had been really attractively decorated. 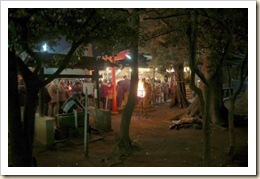 Lit by a combination of Japanese lanterns and wood-burning braziers, the atmosphere was a mixture of levity and real sincere spirituality. This is perhaps the one time of year when the normally secular Japanese reveal a little of the spirituality that underpins their culture. The shrine itself is clearly very old – possibly dating back to the time of the Tokugawa Shogunate or even further. When you look around the site, there are a number of stone shrines, some on them appear to be so old that the carvings and markings that once adorned them have long since been worn away. The stone alter where incense is burned has literally been carved in half by the combustion of countless offerings made over the years. Eventually we neared the shrine itself and got ready to make our offering of a few coins, bang the temple gong to attract the attention of the temple kami or spirit, and say our prayers of thanks and for the New Year. 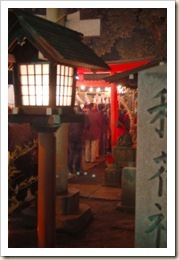 Every shrine has a different tradition. Here, it is customary to bow twice and clap your hands twice before praying. Afterwards, we got our free sake – not the bloody big glass that Big M was hoping for but the traditional “saucer”. But still gratefully received none the less. This was followed by a go on the Lucky Dip (Y won a bag of spuds, presumably from the local farm) and a cup of warm, milky…something, enjoyed while standing around a roaring fire, in which all the lucky charms from last year are cremated. All in all, a very enjoyable evening that had just the right combination of spiritual sincerity and entertainment with which to start the New Year. 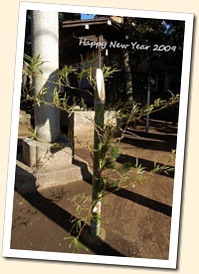 So, if you are reading this, may I offer you our sincere good wishes for the New Year. あけましたおめでとうございます！Akemashita omedetou gozaimasu.